This is subscription based real estate agent virtual open home and listing service provided by https://www.talktothehouse.net. 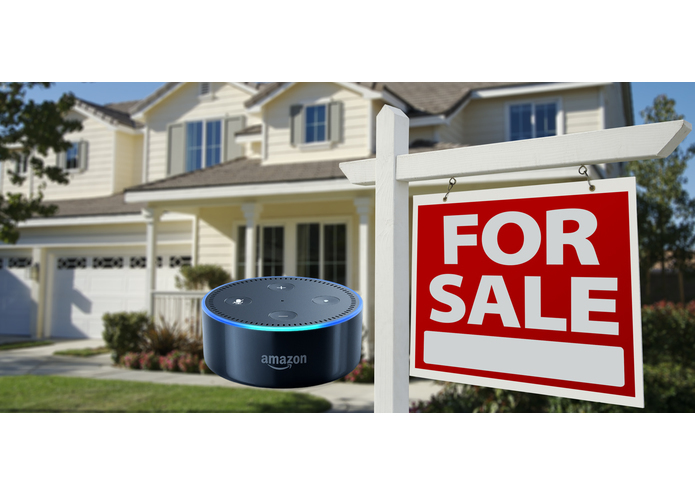 The purpose of this skill is to aid real estate agents in gathering more leads through the Alexa engagement, by providing specific and detailed information about particular property. The system is innovative and puts agent’s listing in the front light. This skill is dependent on having an active subscription with https://www.talktothehouse.net system. LET YOUR LISTINGS BE HEARD Doing business "Old School", in today's world means "Going out of Business". Now with the natural progression of things, and huge advances in voice recognition, we are finally able to give our listings a VOICE! This is a new way how agents distinguish themselves from the crowd. Easy to setup, and manage, based on the trusted and recognizable Amazon ALEXA voice. What better voice could you find to advertise your listing property? OPEN HOUSE MODE Hosting an open house? Great! Put your property into open house mode, turn on sign in feature (optional), and let your virtual advisor sign in your potential buyers. You get an email notification with the client sign in details, and potential buyer gets property report and your contact information via SMS. GREAT conversation starter, not to mention your listing looking like a Million Bucks! LISTING MODE Imagine being able to be there at your listing property every time someone comes in to check it out? Well, now you can! 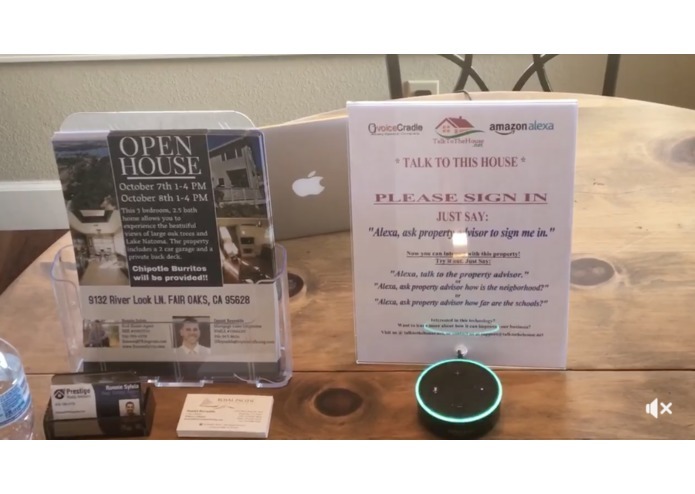 Your Alexa property advisor can be there all the time to provide valuable information, details and sales pitch you designed to the potential buyers. You can even receive message with details what they asked Alexa, so you can tailor your follow up responses accordingly. BIG PROPERTY? NO PROBLEM Having a big property listing? Multiple stories, big square footage? No problem! Run multiple echo devices in the same property. With our "Clone Property" feature, you can clone same property and assign different echo devices to different rooms. Have something specific you want to say about master bedroom? No problem. Just modify description, and your virtual property advisory will tell your clients all about it. 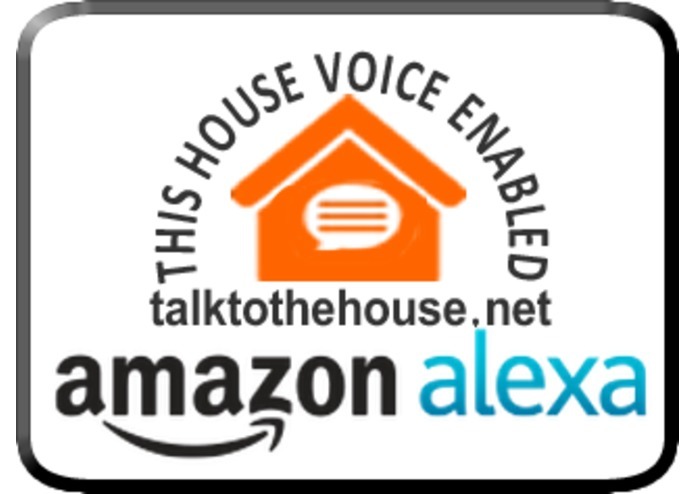 In order to get started please enable Talk To The House Skill in your Alexa app. Got to the https://www.talktothehouse.net and create an account. Mark your account number as you will need it in the next step. Invoke newly installed Alexa Skill with “Alexa, ask property advisory to setup a new device”. Follow instructions. 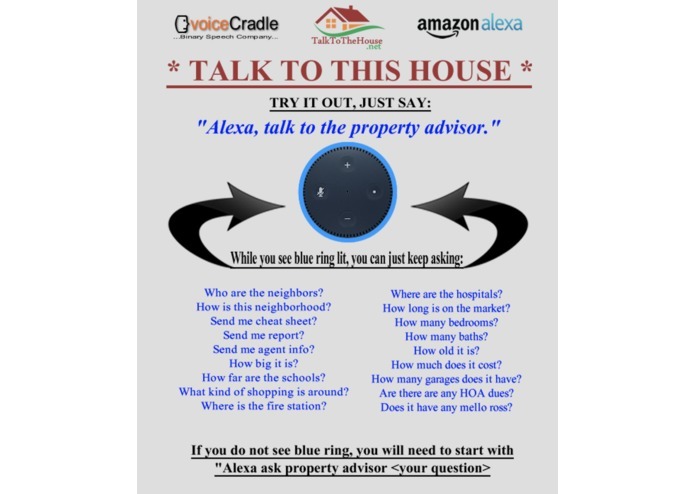 Once your device got REGISTERED with the Talk To The House system, please login into https://www.talktothehouse.net and ACTIVATE your device. Once activated, you can start creating properties that you can attach to your device to play it back.